So when I was using the single speed I just built on its maiden voyage in the Springdale section of Stamford, the chain fell off. When I stopped to put the chain back on, I looked over to my right and noticed a filthy $1 bill lying on the street. I wish that happened every time the chain fell off that day: I'd have had another $13 (I since replaced the irksome chain with a better one). Picking up that dollar reminded me of the big story a few weeks back: Starbucks had a new cup. A white one. Plastic. Reusable. And it cost one dollar. Unless I am stocking up on hurricane supplies, I tend not to go to Starbucks for any reason, much less to drink coffee. I prefer to grind my beans at home and fling four dollars out the kitchen window. But now, I had a reason to return: friends of DIYBIKING.COM will recall Bike to Work Week 2011 when I tested a number of coffee cup lids, including one from Starbucks. Now Starbucks has its new reusable cup, and from what I saw on the news (yes, this was covered 'on the news') the lid looked different from that of the one I had tested. Even though I don't drink Starbucks, I know some of you do, so to my most loyal readers who may be wondering if it is worth spending $1 on a reusable cup, I offer this. It is what it looks like: as you can see I have the coffee cup holder on the handlebars of the DiamondSchwinn/hurricane aftermath bike, which is to this blog what Buster is to the Mythbusters. Once again, I have a foam board collar and some white sheets of paper so I could evaluate how the cup would perform in a real-life setting: namely, biking to work or to a friend's house. From right to left: You've got your common Solo Traveler lid. Easy to sip but the uncovered opening allows coffee to spurt skywards when hitting a bump in pavement, but there's a tiny little hole in the crescent so any coffee spilled onto the lid drips back into the cup. The middle cup is the Solo Traveler Plus - the Rolls Royce of disposable coffee cup lids. I desperately want retailers and coffee shops to switch to this one: it has a tiny lever that allows you to open and close the opening at will, which makes for a very clean commute. The cup on the far left is the reusable Starbucks cup. Unlike the other two, it is reusable but the lid has no moving parts, so I was immediately wary of the opening. Additionally, it didn't even have the onboard drain hole of the Solo Traveler, so I was pretty sure this wasn't going to be a spotless coffee run. Now after the messy and scalding fiasco with the last Starbucks test, I decided not to actually use Starbucks coffee. Don't go all did-Beyonce-lip-sync-the-national-anthem? on me: the test is all about the cup, which I already had, and in my home there is usually a coffee pot with anywhere from zero to six cups of dark nectar inside. The afternoon of the test, there was almost two cup's worth of cold coffee in there, and I thought it would be a good stand-in for Starbucks. Another difference this time was the climate: Bike to Work Week takes place in May, which is a month created for cycling outdoors. This is January - and when the temperature is in the teens or below, you want to put something on your face that isn't sunscreen. Since normal bike glasses fog up when wearing the neoprene face mask, I use Lindsay Vonn-inspired ski googles. I admit it does look rather peculiar (I noticed a pedestrian at the corner of Broad and Bedford taking a picture of me) but the mask is so comfortable I often forget I'm wearing it. However, if you ever dress like this and have to run an errand at the bank, make sure you take it off before you go inside. Notice my GoPro HD Hero 2 camera mounted to record the action. I know, I know: the web is full of Red Bull-guzzling guys who are taping themselves base jumping, sky diving and going down dangerous rapids. I, on the other hand, cover spilling coffee. So I set off, went one mile, and had predictable results. It didn't go well. If you are unlucky enough to have one of these Starbucks travel cups, try not to travel anywhere with them. And if you do, take a cordless drill and add a tiny hole to the center of the lid so the spilled coffee can drain back into the cup as oppose to creating an on-board Petri dish like you can see in the photo. Later, I opened the GoPro video. Some coffee landed on the lens 3/4 through the journey, but other than that it came out beautifully. Unfortunately, neither YouTube nor Blogger can stand to be around it, so you'll have to take my word for it until I sort out what went wrong and can post it here. 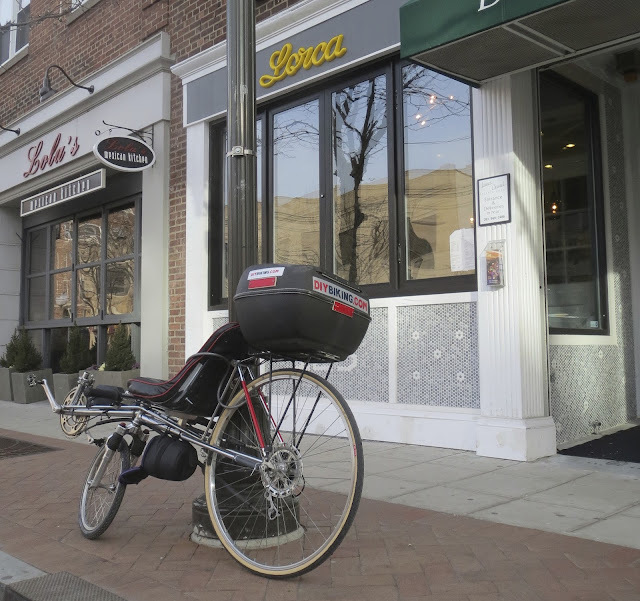 It was an unsuccessful multimedia presentation, so later I took the recumbent to Lorca, a new coffee shop on Bedford Street in Stamford. I ordered a coffee and Churros; a delicious treat that is probably in the donut family. And I stayed in Lorca to enjoy it. "You know, a lot of times people are in a big rush, and often they feel like they need coffee in order to get where they are going even faster. But there's more important things than taking your favorite drink when you're on the go or capturing the experience in high definition. Sitting still with friends and family, savoring ever sip of your time with them, and really enjoying being where you are matter a whole lot more. And the best reusable cup is a ceramic mug from your local coffee shop." Now read this next line with my intonation: Thanks for reading and thanks for riding.